I’m starving! Time for brekkie. I don’t know about you, but I don’t start my day, not every day anyway, with what they call the full English breakfast: fried eggs, stewed tomatoes, sausage, toast, beans (beans, ugh) black pudding (blood sausage, yikes! but my dad loved ’em) and, oh I dunno, mushrooms, avocado, etc. My dad would have added fried bread. Not my breakfast. I’m a cereal woman. Usually Cheerios with a sliced banana. Sometimes porridge. That’s oatmeal to you, Yankee. To be honest, calling my Quaker Oats “porridge’’ is one of my few remaining shout outs to my British heritage. Another is calling what you term a washcloth, a flannel but I digress. 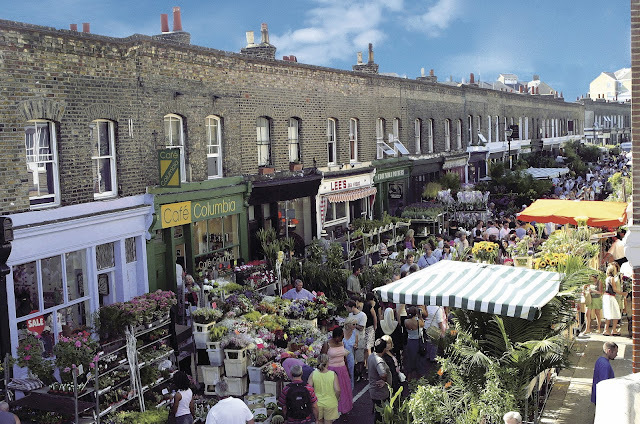 Run by a pair of twin brothers, the cafe is on Brick Lane and the object of controversy. 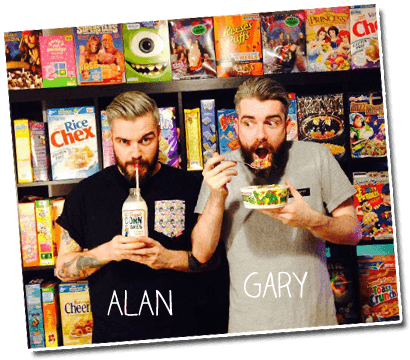 The Keery twins are accused of gentrifying the neighborhood, pushing high end pricey and trendy foodstuff instead of creating anything for use by the local community in which they’ve inserted their colorful little restaurant. Judging from the lines, the 1%ers don’t seem to care. Close to Spitalfields and Petticoat Lane, the cafe is in a part of the East End of London that’s seeing a lot of spiffing up lately, a center for fashion and the arts, the area is known for producing cutting edge artists such as Banksy, Stik, ROA, D*Face, Ben Eine and Omar Hassan. Breakfast out of the way and my milk mustached dabbed away, we’ll head over to the Columbia Road Flower Market to stop and smell the roses. As far as the flower growers go, I couldn’t help noticing that 7 out of the 8 flower growers featured on the site are men. The remaining grower is a married couple. Just saying when you stop to pick up a bouquet, who knows you may pick up something else. Our bellies fed in yummy kid style fashion, let’s feed the kid inside a bit more at the V&A Museum of Childhood in Bethnal Green. 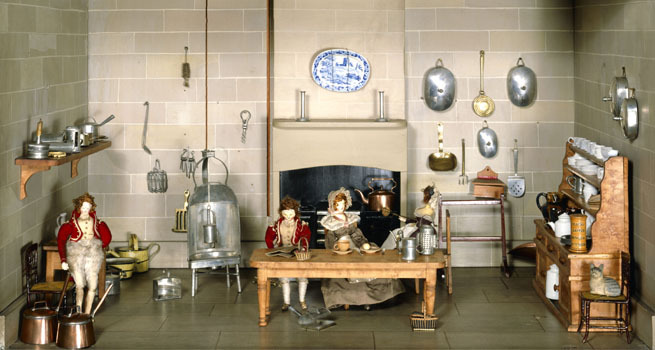 There are four main galleries in the museum focusing on Childhood, Moving Toys, Creative and the Front Room gallery. Dollhouses, old-fashioned toys, moving objects like k'nex and all kinds of building sets from Legos to Meccanos. 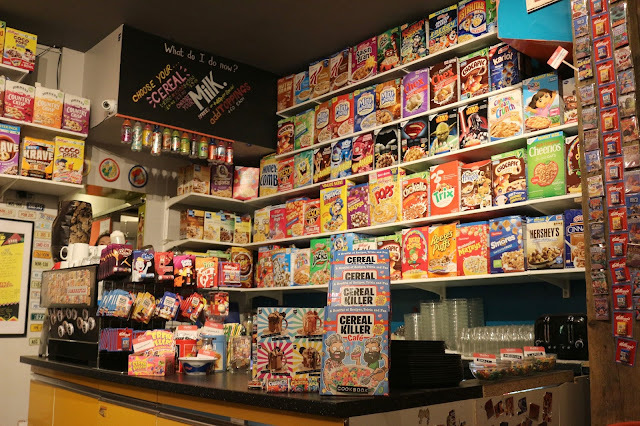 Full of old and new fashioned ways kids can interact with each other and the world, the Museum of Childhood may be about kids, and for kids, but like cereal, grown ups like it too. I think I’ll just stay here and revisit my youth. The museum has over 100 dolls' houses on display throughout the museum, dolls' houses that remind me of the old fashioned doll house my dad made me back in the day. While I’m sure I coveted a Barbie’s doll house complete with swimming pool and a convertible in the garage, that doll house my dad made and mother decorated when I was 8 or 9 years old, is what I remember. My father wasn’t the handy type—he didn’t have a garage with a workbench and tools, and I don’t recall him hammering anything but the occasional nail to hang a picture—but somehow he built a two story dollhouse about 3 feet high, down in our basement, taking me completely by surprise on my birthday. The acrid smell of the glue they used to stick the carpet down on the floor and wallpaper to the walls—they’d gotten hold of books of carpet and wall paper samples, probably from a vendor my dad worked with at the store he managed—is a scent that sticks in my nose to this day when I think of doll houses. Let me get in there and have a look see at what else they’ve got. There are art sessions where I can build a puppet (although it’s probably an activity reserved for the kiddies) there are storytimes where kids can help tell stories using props and exploring sessions where children are given short talks about a display and then given a chance to handle it themselves. Beyond that I’m not sure how interactive the place is, lots and lots on display but it doesn’t look like there’s that many things a kid can actually play with. Correct me if I’m wrong, please. Still, admission is free but I’d happily part with a fiver for the trip back to my childhood. 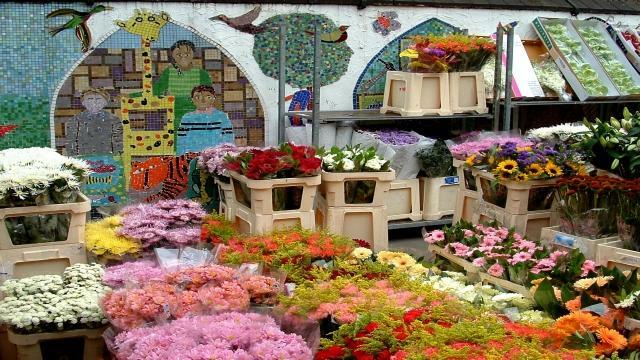 Love the photos of the flower market. We're in the midst of a long string of gloomy days and about to get wallopped by an ice storm. Some cheery flowers are just what I needed!